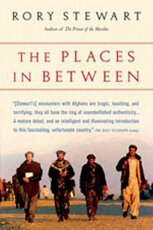 In January 2002 Rory Stewart walked across Afghanistan -- surviving by his wits, his knowledge of Persian dialects and Muslim customs, and the kindness of strangers. By day he passed through mountains covered in nine feet of snow, hamlets burned and emptied by the Taliban, and communities thriving amid the remains of medieval civilizations. By night he slept on villagers' floors, shared their meals, and listened to their stories of the recent and ancient past. Along the way Stewart met heroes and rogues, tribal elders and teenage soldiers, Taliban commanders and foreign-aid workers. He was also adopted by an unexpected companion -- a retired fighting mastiff he named Babur in honor of Afghanistan's first Mughal emperor, in whose footsteps the pair was following. Through these encounters -- by turns touching, confounding, surprising, and funny -- Stewart makes tangible the forces of tradition, ideology, and allegiance that shape life in the map's countless places in between.